Take a look at some of the outstanding dogs that make up much of the pedigree's of our Sire's and Dam's at GRAND RIVER GUN DOGS. 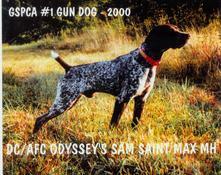 GAMBLE'S GUNNER VON FRITZ SH - A son of DC AFC 3 x NSTRA CH GAMBLE'S ODYSSEY FRITZ MH UT 2. 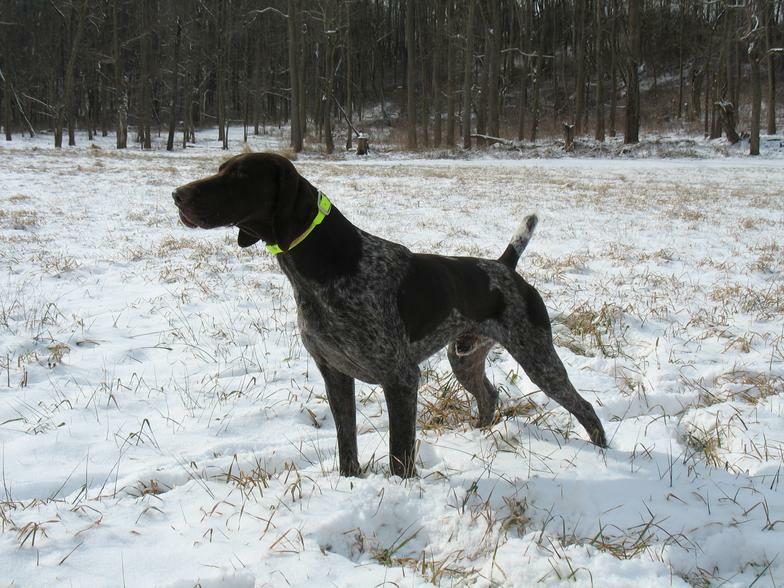 Gunner was on his way to really making a name for himself but his life was cut short by a tragic hunting accident. DC HILLHAVEN'S SUNSHINE - A duel champion sired by the 2nd all time produer of Duel Champions, DC HILLHAVEN'S HUSTLER. GAMBLE'S JUMPIN' JACKIE MH - DAM OF GRGD GAMBLE'S TAZMAINIAN DEVIL - Jackie sire is the great DC AFC 3 x NSTRA CH GAMBLE'S ODYSSEY FRITZ MH UT 2. 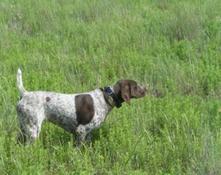 Jackie is the dam of Gamble's Tazmainian Devil who we have high hope's for here at Grand River Gun Dogs. 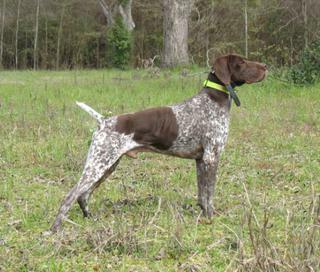 FIELDMASTER'S SILVER DOLLAR MH - His call name is "Cash" . 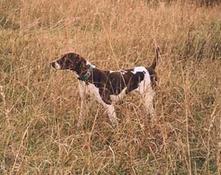 Cash is a direct son of the great Gamble's Odyssey Fritz. 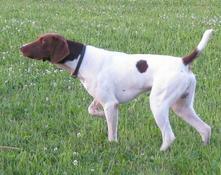 Cash is owned by Tom Ruby of Silver Dollar Kennels. 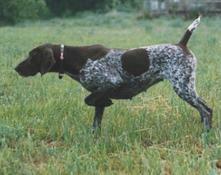 Cash when bred to one of Grand River's females, SCHARRER'S COCO, produced our great stud dog SCHARRER'S BUDDY. 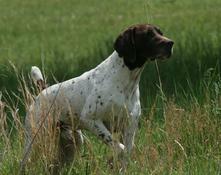 Tom is located in Michigan and is an outstanding trainer and breeder. 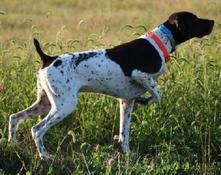 He took Cash to his MH title along with many other dogs over the years as well. 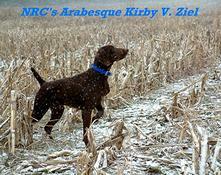 DC AFC 3 x NSTRA CH GAMBLE'S ODYESSY FRITZ MH UT 2 - SIRE OF FIELMASTER'S SILVERDOLLAR MH - You name it, Fritz has done it. 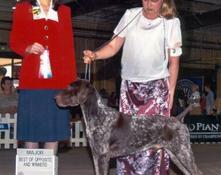 One of the most titled dog ever and a Test Sire of the Year Winner. 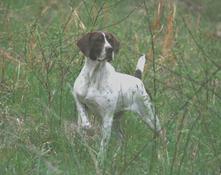 Owned by Rick Hopkins of Walnut Hills Kennels in Georgia. 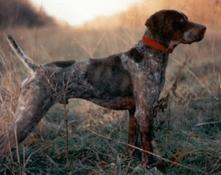 Fritz is just one of the outstanding dogs owned and bred by Rick. 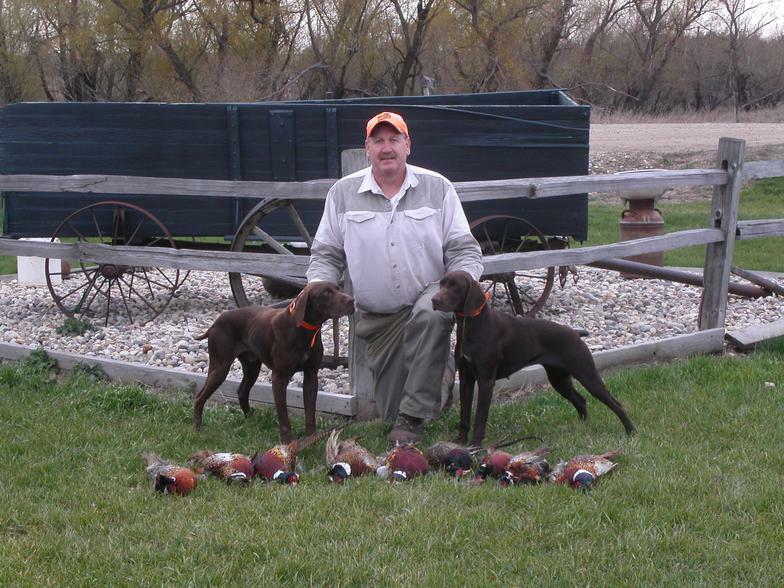 His partner & companion, Brenda Roe, is also one of the top breeders, handlers, and NSTRA trialers in the country. SCHARRER'S BEAR ON THE LEFT, SCHARRER'S COCO ON THE RIGHT. COCO ABOUT A 1/ 1/2 YEARS OLD AT THE TIME. BOTH EXCELLENT EXAMPLES OF THE DC HILLHAVEN'S HUSTLER BLOODLINE.